Greer will be three weeks old tomorrow. She is adjusting to this big bright world just as she should. Her infancy is reminding me so much of Gideon’s. First, they look very similar – my skin tone, blue eyes, Poppy’s hairline, long bodies with skinny appendages. Her chin is slightly different, more feminine and girly and her smiles reveal a dimple in her cheek – my first baby with one! She has long skinny feet with the same toenails as her brother. Second, they both love to sleep upright on someone’s chest. Gideon ONLY slept that way for six weeks and I am assuming that’s how long it will take this little girl to let go of being upright too. Third, they love feats of strength. She has decidedly non-2-week-old neck strength and control, just like her big brother did. If you put her in a pack and play or crib or on any other solid surface on her tummy, she will scoot and spin around in an uncoordinated, cheek rubbing experiment of mobility. It’s adorable and scary all at the same time. There’s probably more, but I forget now. However, she is all her own person in this whole needing help to burp and sometimes spitting up thing. The other two were normally gassy babies, don’t get me wrong. They had those moments when I started to question what I’d eaten or how good their latch was for that last feeding, but they very rarely spit up. To be clear, she is not horking milk all over me, just tiny little dribble amounts, but I’m always caught off guard (my fellow slow learners, please raise your hands). And she needs SO MANY back pats to get those burps up. Her face contorts in pain and annoyance while I try to help her work it out. It’s not just the burping either. She’s a lady so I won’t say the name of the other kind of gas she has, but I think you might have an idea about it. She makes the same sad little faces with that but she adds little screams to the experience. Nothing makes a Mama feel sadder than her less one month old yelping in pain. I’m pretty sure that the gas is caused by the ridiculous amounts of milk I’m sending her way. Affectionately known as hyper-lactation syndrome, I have a very abundant milk supply, so I produce copious amount of foremilk (higher in water content, higher in lactose and usually delivered with greater force during letdown – the gas triumvirate!). All of that foremilk alone could be making her stomach cramp, or it could be from all the gulping she’s doing. Upon this realization, I’ve started keeping her on one side longer and will start pumping right before I feed her to take the edge off. She for sure hasn’t been getting enough hind milk because she wants to eat constantly. We’ll change up our routine and see if it delivers positive results. It’s the normal way for two week old babies to be awake more and to be more gassy, so I’m taking the whole thing with boulders of salt and thanking God we live close to my parents who have been a gigantic help to me while Jud has been out of town on business. They’ve helped make meals, magically made the gassy girl sleep for long stretches and entertained the older two while I nurse the tiny one. I’m sure I could do it without them but I’m so glad that I don’t have to. The very first time I was pregnant, Jud and I began listing out names we liked on the white board in our office almost right away. It was a big deal. Naming a human should be a big deal, I think. They are going to walk around with that handle for the rest of their lives (barring a lot of work at the social security office. Okay, maybe not work, but at least a VERY long wait to deal with people who obviously hate life and wish they were not government employees in spite of their cush pay and benefits. Seriously. It is so much worse than the DMV). El Elyon: “The Most High God.” Stresses God’s strength, sovereignty, and supremacy (Gen. 14:19; Ps. 9:2;Dan. 7:18, 22, 25). (2) Yahweh (YHWH): Comes from a verb which means “to exist, be.” This, plus its usage, shows that this name stresses God as the independent and self-existent God of revelation and redemption (Gen. 4:3; Ex. 6:3 (cf. 3:14); 3:12). Compounds of Yahweh: Strictly speaking, these compounds are designations or titles which reveal additional facts about God’s character. (6) It is at the name of Jesus that every knee will one day bow and every tongue confess that Jesus Christ is Lord (Phil. 2:10-11). So, just as the name of God in the Old Testament spoke of the holy character of God the Father, so the name of Jesus in the New Testament speaks of the holy character of God the Son. So, names. They have importance to God and if they are important to Him, we want to see the importance of them too. Gideon Charles – G means “hacker” although we initially only found the meaning of ‘warrior’, which we liked. Hacker seems slightly more violent than warrior, but we’re cool with that too. C means ‘strong, manly’ and is also my dad’s middle name. We would love people to know our son as a strong, manly warrior/hacker. We want him to stand up for justice and not shrink back from doing the right thing. Piper Elise – P means just what you think it does, “one who plays the pipe”. We wanted her to have a musical name without being too overt. Elise means “consecrated to God” and that is exactly what we want for our little girl and her music. We are praying that she will be a woman who devotes her life to His purposes and His will. Greer Elizabeth – G means “watchful, vigilant”. One of the things we’ve noticed about the current state of affairs among people is their strong attachment to instant gratification and the present. We want her to be able to delay gratification by keeping the future in mind. Being watchful about her life and vigilant to stick to the truth will be good tools to help her in that endeavor. E means the same thing as Elise – “consecrated to God”. We liked it for its meaning and also because our dear friend, Sarah, has the same middle name. We hope Greer is a woman much like Sarah. Her character is exemplary. Her heart is sensitive to the Spirit of God and we love how she loves on our children. We hope our new girl is much the same. And that’s why we named them that. 1. Were you too late to get an epidural? – Nope. Although the last two deliveries were indeed undertaken with an epidural firmly in place, they were also different in that I had pitocin on board after my water broke while I wasn’t in active labor. Since I’d already had medical intervention (the Pit), I was also for the idea of a pain killer. With Gideon I tried to not have an epidural and the complete lack of a break between contractions mixed with the constant pain was too much for me. I took a narcotic first and just felt drunk so then I went all in with an epidural. When I wound up on Pitocin with Piper, I knew we were headed to that same dark place and had the epidural pretty quickly. This time, since my body finally did the right thing and WENT INTO LABOR, I went with it and let it do its thing without any intervention. 2. Would you do it again without drugs? – Absolutely….if I don’t need Pitocin. The recovery was swifter and simpler and frankly I just felt better. Additionally, Greer seemed much more alert and those first two nights in the hospital seemed very much like the other nights I’ve been spending at home with her. In other words, she was herself right away. That’s a plus for me. BUT if I needed to be induced or my body once again decided to not go into labor on it’s own but my water was broken and the dread Pitocin was coursing through my veins, I’d be all over a needle in my spine. 3. Did you like the midwives? – Did I?! It was pretty routine during most of my appointments throughout the pregnancy. Maybe they spent more time with me than the average OB, but for the most part things were pretty standard. The labor process was completely different. I felt like I had an advocate directing the process and a guide walking me through the whole experience. I would absolutely recommend them to anyone, but especially to a first timer who wants to be helped through labor by a professional. 4. How are you feeling? – Pretty good. Somedays I feel so good that I try to figure out how to get running again sooner than six weeks out. And then there was yesterday where I vacuumed and started passing blood clots and bleeding too much. So, I’m sitting down now. And my house looks kind of crazy (think laundry piles and coats and blankets randomly strewn about), but we’re okay and the bleeding has calmed down considerably. 5. How’s Greer doing? – She’s a normal two week old. She is starting to be awake more but her days and nights are mixed up, so I am not all that excited about that development. She eats awesomely and frequently. Her diaper changes are not filled with screaming, so she doesn’t mind being cold too much. She had a bath the other night and she loved it. 6. Are you getting any sleep? – Yes, but 45 minutes spurts through the night are less fun for me. When my parents or Jud are at home, I try to speak up and ask them to hold her while I grab a nap, but sometimes I’m trying to get too much done instead of just resting and knowing that all the ‘stuff’ can wait. 7. How are the kids doing with the new baby? – Really well, all things considered. Gideon has declared a few times that he’s glad she is a girl and that he loves her. Piper talks to her like a sweet little Mama with lots of kisses and loving back pats. In the not so great category, Gideon has been a little wilder here and at school and Piper has been talking in an odd baby language that mostly contains the words “cake” and “coke”. I think both of these oddities will subside in due time. 8. What do you want to eat? – Everything. I am starving. Bring of the carbs and protein and lots and lots of vegetables. I am especially in love with yellow squash, zucchini and dark chocolate. I want orange julius and cranberry juice with sierra mist. I want to go to this event tonight where Rick Bayless is cooking. Instead I am making tuna casserole. It’s surprisingly delicious. Have you ever gotten into the tub to soak away some pain from overworking your legs or to ease some back pain and it pretty much takes away all of it? Well, water does not do that to contractions. A dear friend who recently delivered a baby commented that ‘water is not nature’s epidural’ and indeed it is not. Although I was in the water, the pain was still getting worse, but only when the contraction actually hit. The rest of the time, I felt pretty much normal and had a really nice conversation with my midwife about her daughter and her son-in-law and the military and moving. It was really a lovely talk, but it only occurred in between the pain. When the pain hit the weightlessness I felt in the water just took the edge off. Maybe thirty minutes in the tub and I felt like pushing. Water births (this one’s for you Jenn) aren’t exactly my thing and aren’t okay with the hospital where I was delivering so out I climbed and into the bed I went. Okay, so maybe that water was doing a little more than I thought it was because at this point I thought I wasn’t going to make it. I’d lost the bike and I was worried. The midwife reminded me “Ride it up and coast down.” I focused again and made it through three more contractions before she said I was going to go ahead and push. This contraction was, of course, accompanied by the Ring of Fire and unfortunately Johnny Cash was not resurrected and singing to me by the side of the bed (Side Note: If you are one of those people who plan music to birth by, I would highly suggest that song for this part). And the burn continued while I pushed for that contraction and her head was delivered. The midwife told me to hold up and wait for the next one. I didn’t know that she was unwrapping the cord from around the baby’s neck, where it was loosely hanging (FACT: one of my biggest fears has always been to strangle my own baby while delivering him/her. I am so very very thankful that 1) I didn’t know the cord was wrapped around her neck before I went into labor (like they are for 1 in 4 babies) and 2) that I didn’t know this until after she was on my belly and looked just like my other two non-strangled babies). 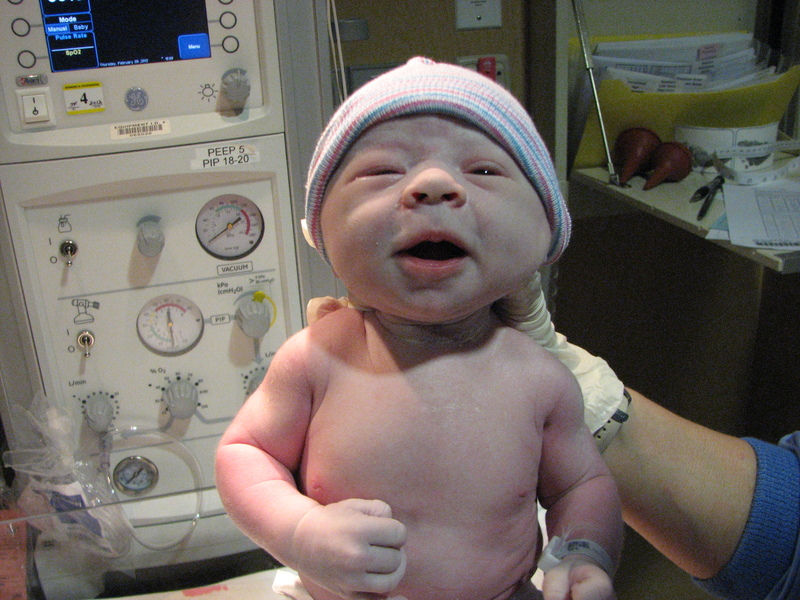 The next contraction came quickly and I pushed one more time to deliver her shoulders and body. The fire was still burning. I screamed during the pushing like a crazy person on TLC’s the Baby Story. It was completely involuntary and even while I was doing it, I was thinking that I should stop. No way to keep that kind of sound inside my throat, though. They put Greer on my belly and she was the bluish white of brand new baby, squinty and mad. The burning kept going (it lasts for an hour, peeps. I HAD NO IDEA.) and I felt lightheaded and tired in a not so great way. They asked me if I wanted to cut the cord and that kind of wigged me out. They asked my dad, who had been holding my hand while I pushed and he was taken off guard by it, but he did it happily. Placenta delivered and then the midwife started barking orders to the nurse. There was a lot of bleeding and my uterus wasn’t clamping down.Some Pitocin on board and all calmed down, I still felt a little out of it and bad so they gave me a little narcotic of some kind. I was thankful for it and held Greer again. She looked a whole lot like Gideon when he first “popped out”, as Piper likes to say, but with Piper’s chin and slightly more delicate in the face. Her feet looked like his. Her hair line matched my father’s. She has Jud’s frame and my features. I think she’ll be a good mix like the other two. Her eyes are still dark blue and sometimes I think they are getting lighter and other times they look darker. Time will tell. She is here and she is wonderful. I am tremendously happy about not being pregnant anymore and everyone else is tremendously happy to get to hold her too. It’s the Tuesday after she was born and already these details are starting to get foggy. Good thing I’m trying to remember now because in a few years, when Greer asks me about it, I imagine my mind will be exactly like all of that cream of wheat I was told to consume while pregnant. Wednesday dawned with hope and more contractions. I parked my pain-filled rear end on the sofa to keep the baby from coming. By late afternoon I was thinking that I could keep her in there for weeks. Then Jud called to say he was sick and I felt the bottom drop out. He drove to our house to be with the little sick ones. He spent most of the evening sleeping with chills. I watched some more Travel channel and lusted after the delicious things Anthony Bourdain was eating in France while I painted my nails. If you’re going to push a baby out, you have to have pretty toes. I think this was the signal to my body to tell it that I would go along with the labor process. I ate dinner by myself and crawled into bed without Jimmy Kimmel’s jokes or the pain of searing heartburn. I woke up around three when a strong contraction convinced me not to sleep. We danced the dance of sleep and pain until eight when I finally convinced myself to get ready for the day. By the time my hair was straight and my mascara was on I was having trouble staying upright when the pain hit. I went back to the couch and found a website that would help me time my contractions. They were still six or seven minutes apart when I called over to my house and asked my dad to come pick me up, but they were strong and I was nervous about delivering a baby at home like someone who didn’t know they were pregnant in the first place. While I waited for him, I filled out the pre-registration forms for the hospital. Nothing like being prepared. I convinced Jud that he was indeed still sick, although the Tamiflu was clearly making him delusional. Later, after he showered, he texted to admit that he was feeling awful and that he was sorry about not being there for the delivery. I was sorry too, sorry but focused on the task at hand – delivering a healthy baby and keeping her that way. Arriving at the hospital, I asked the woman at the lobby desk where I was supposed to go. I’ve never done a dry run of the hospital labor and delivery department. Three babies, three hospitals and three times I’ve asked where I was supposed to go once the show was already on the road. Up the elevator and into the right place, the nurses seemed doubtful about me being in labor. I’m not sure what I’m supposed to act like when I’m in labor, but apparently I do a poor job of looking like I’m in pain. Hooked up to the machines, the contractions are four minutes now, so I’m not going anywhere. The midwife hasn’t arrived yet, but the nurse asks about my pain. I tell her that in the middle of the contraction it is an 8 or a 9. She disagrees with me and says that I would have asked for pain meds by now. I realize that I’m not a huge fan of this nurse and hope that the midwife comes soon. She does and I’m relieved. She asks me if I want her to break my water. I say yes. She does and it is easy and not painful and almost immediately the contractions are coming faster. Then she delivers the single most helpful idea about the waves of pain that are coming. She tells me that the contractions are all going to be about one minute and that they will build for 30 seconds like riding a bike up a hill and then I can coast down the other side. She asks me if I want to walk and we do that for a while. When a contraction comes, we stop. I hold on to the railing in the hallway and alternately plie onto my heels or rock back and forth in my hips, but in my mind, I’m riding the bike. Up the hill. Coast down. Walk. Up the hill. Coast down. Walk. Up the hill. Coast down. Walk. I don’t know how long we walked, maybe 45 minutes, I guess. Right in front of my room a big long contraction hit and the midwife suggested getting in the water. I was all about that idea. Greer Elizabeth entered the world on February 9. It was a Thursday afternoon and it wasn’t the way I thought it would happen. In some ways it was better than I could have ever expected and in some ways it was the opposite of better. The story really began the Friday before she came when Gideon climbed into his bed and fell asleep about 4pm. His light was on. His fan was off. He was so deep in sleep that I had difficulty waking him up. Piper kissed him saying loudly, “wake up, my prince!” and proclaiming him a sleeping prince charming. Finally awake, with help from his Yia Yia, he wasn’t in a good mood and he complained his neck was hurting. I, of course, immediately assumed he had meningitis. He has never, in his four and a half years fallen asleep without his routine, unless he’s been really ill. WebMD inspected and meningitis was ruled out, but I figured he had some unforseen sickness lurking around the corner. The fever started sometime in the middle of the night. He was only complaining about his leg cramps, but his head was plenty hot. Meds on board and he was back to sleep. Four days later he seemed fine. He didn’t seem that sick to begin with, just exhausted and feverish and his eyes were oddly red and puffy looking, nothing he would ever complain about. He isn’t the only kid in the house, so waking up on Tuesday with her head hot and those same puffy eyes, I wasn’t surprised to find Piper sick. 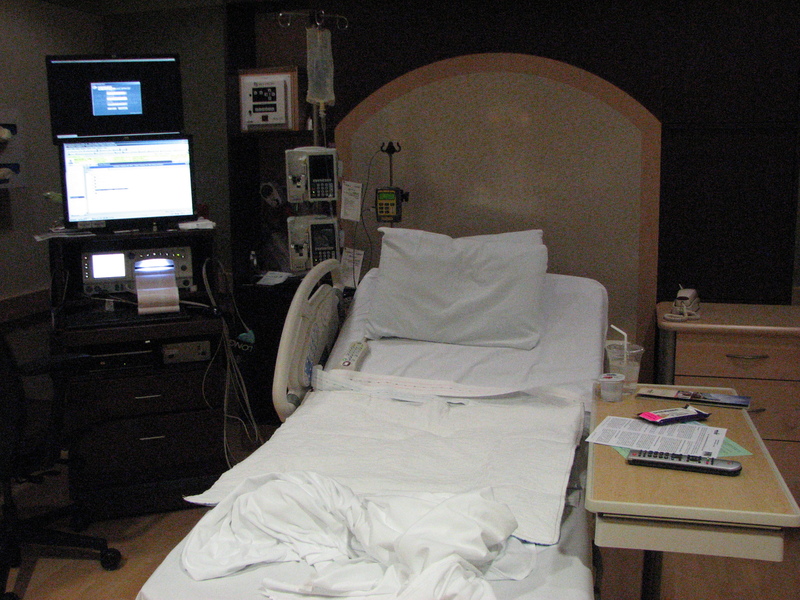 Monday night I’d had some pretty good, strong contractions, but nothing I couldn’t talk through. I did think we were getting close and I was wondering how the sickness was going to change the new baby’s home coming. First thing Tuesday morning I made an appointment with the Pediatrician to get a professional opinion about a good course of action. With Piper looking just this side of horrible and Gideon proclaiming that he was fine, we went off to the doctor. Poppy drove us as I wasn’t feeling great and couldn’t pick up the little girl who didn’t want to change out of her pajamas to go. Gideon’s throat was swabbed. Piper’s nose got the same treatment. His was negative (no step!). Hers was positive (Influenza A!). Our fantastic Peds doc prescribed Tamiflu for my parents, Jud and Piper. I was heading for my weekly appointment with the midwives in just a few hours, so we agreed that we’d let them prescribe for me. We also agreed that the kids should be kept separate from me and decided to let the kids go to our house and I would go to my parents house until everything was over. Jud stayed with me at my parents’ house that night. My parents stayed with the sick kids. I contracted until 10ish and then abruptly stopped. The Tamiflu made me gag a bit. It made some of the others dizzy, but we were thankful to hopefully be preventing the onslaught of awful.